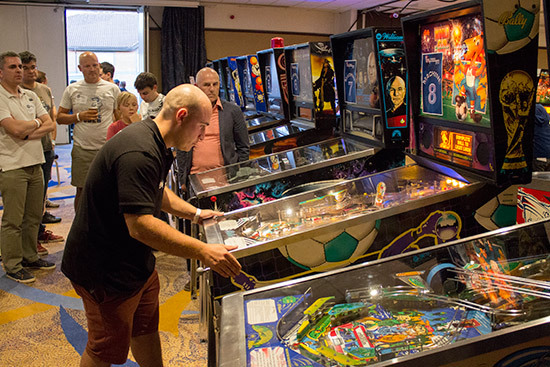 On the last weekend of August, pinball fans from across the world flocked to the Daventry Court Hotel in Northamptonshire, to get their pinball fix at one of the biggest pinball shows in the country, the UK Pinball Party 2014. The exhibition hall was filled with rows of pinball machines, 91 in total, all of varying ages from the old classics such as Addams Family (Bally 1992), Funhouse (Williams 1990) and Star Trek - The Next Generation (Williams 1993), to some of the newest releases including Star Trek (Stern 2013) and Mustang (Stern 2014). The organiser of UK Pinball Party over the last few years has been Andrew Heighway, who has been developing a pinball machine of his own over the last few years called Full Throttle, based on an original motorbike theme. At the event this year, he unveiled an improved version of this game in a presentation with a Q&A and audience demo afterwards. 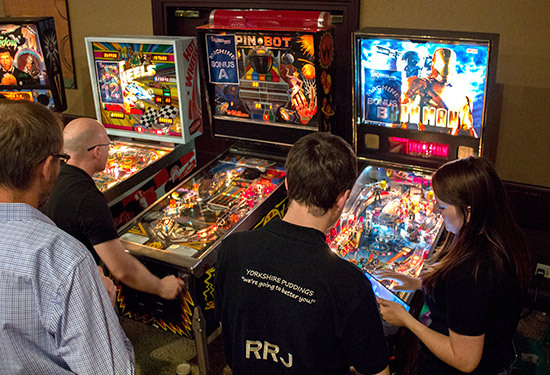 The opportunity to take part in tournaments is the main draw to the UK Pinball Party for many visitors. 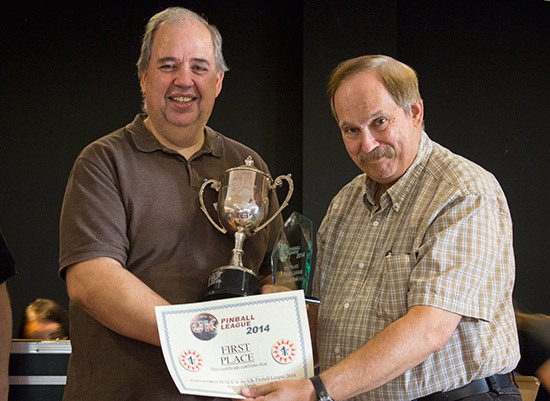 Team Tournaments kicked off the competitions that weekend on the Friday night followed by the UK Pinball Open on the Saturday morning. 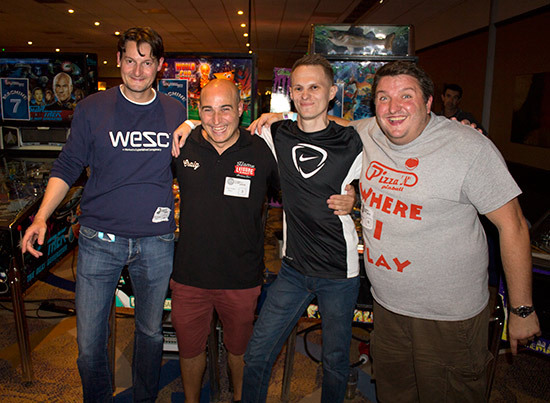 “The UK Pinball Party is always one of the stand out events of the Pinball calendar in the UK. This year was no exception, it was a jam packed weekend, with loads of pinball machines from different era's, vendours, industry greats and big competitions. From a personal perspective the competitions are my main reason for attending the event and this year saw the biggest field of competitors in the UK Open ever at 137 players. The first round of qualifying saw the 137 players vying for the top 24 places in order to continue in the competition. Clearly with such a huge cut it was always going to be very difficult to qualify. Luckily the bank of machine's on offer in the competition this year were a nice group of machines, with a number of my personal favourites, so I felt comfortable on the machines and managed to put together a strong qualifying run. After qualifying had finished I ended up 2nd overall. In the 2nd round, the 24 remaining players played against each other again, with the top 8 players going through to the semi final. Again, this was a harsh cut line, so you had to play very well to make it through. I played a couple of good games, but then had an awful game on Star Trek the Next Generation finishing with 150 million points, which meant that I had to finish top on my final game if I was to continue in the competition. I got drawn on Funhouse which I felt confident on and had a strong game scoring 24 million points and making it through to the semi final. In the semi final the competition was extremely strong, with some of the best players in Europe involved. I felt confident on most of the machines now, but if there was one machine that I didn't want to get drawn, it was Star Trek. And of course, the game that I would be playing in semi final was Star Trek! Luckily though it all just seemed to work, I made some good saves and managed to pull away from the other players. By the third ball I had guaranteed my place in the final and the pressure was off, so played very freely and made it to Final Frontier with a final score of 5.5 billion points! It was certainly the best ever game I have played in competition. The final came down to me, Franck Bona (French no.1), Luckasz Romanowski (Polish no.1) and Paul Jongma (previous European champion). The final game drawn was World Cup Soccer, not my favourite game, but certainly not my least favourite. In the end, it came down to me or Paul to take the title, and on my last ball I just came up short, finishing second after a good battle, with Paul as the worthy winner. 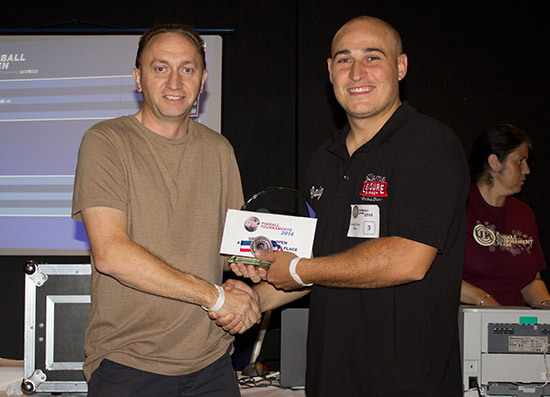 We were really pleased to hear that Craig had managed to secure Second Place in the UK Pinball Open, pictured here receiving his award from the Head of the UK Pinball Open, Peter Blakemore. That evening new members were inducted to the UK Pinball Group Hall of Fame for significant contribution to pinball in the UK. These included Pinball Expo organiser Rob Berk and Mike Pacak, Pingame Journal Editor Jim Schelberg and Pinball Daze’s Dave Wilcox. Despite his recent battle with bone marrow cancer, UK Pinball Party visitors were happy to have special guest Barry Oursler join them at the Daventry Court Hotel signing their memorabilia, chatting with fans and presenting awards. Barry was famously on the design team for many Bally/Williams pinball machines, including Doctor Who (1992), Bram Stoker’s Dracula (1993) and Pinbot (1986), until he was made redundant in 1996 when the whole pinball industry was struggling in a battle against video games. 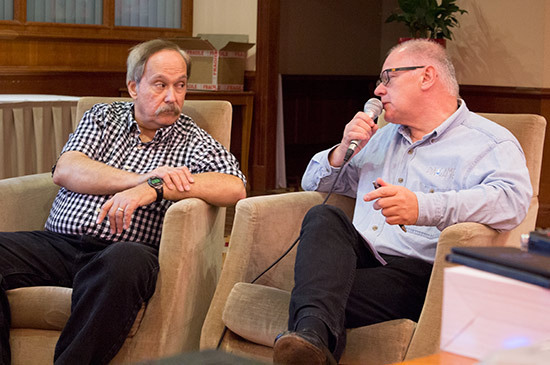 On the Saturday evening, Barry was also newly inducted into the UK Pinball Group Hall of Fame, before talking about his career in the industry with interviewer Gary Flowers. 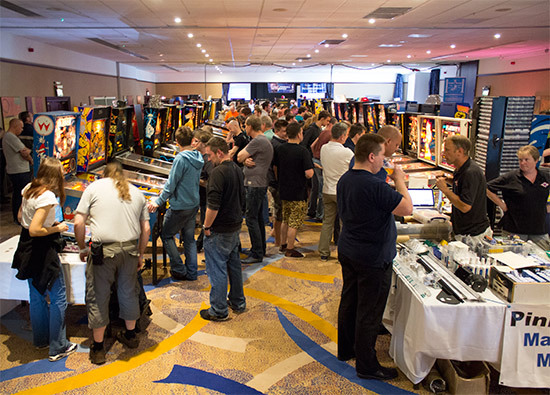 The UK Pinball Classic on the Sunday, challenged players to get a high score on a selection of eight machines. Craig Pullen managed to secure himself a place in the Semi Final on the Mr & Mrs Pac-Man machine, but unfortunately didn’t make the top four. 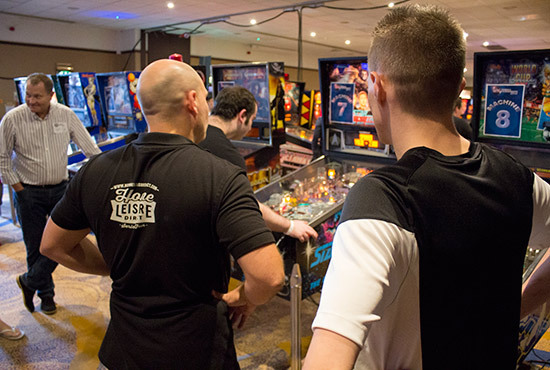 The UK Pinball League’s National Final was also help this weekend at Daventry Court Hotel, seeing the top players from each region in the UK battling for the trophy. Players competed for the highest ranking across all five selected machines for their place in the top of the division they qualified in. Craig managed to secure third place in the end, with 66 points, below Andy Foster with 69 points and Martin Ayub of Pinball News in first place with 77 points, pictured below. 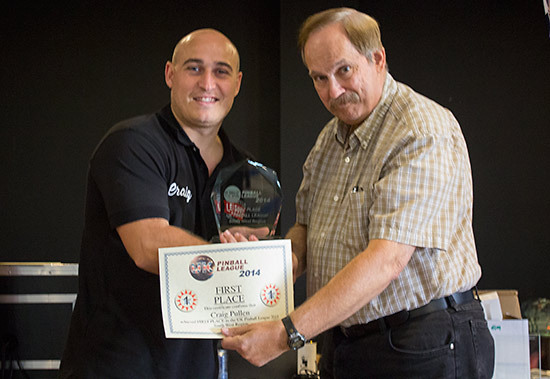 Next came the awards for winners in each region in the UK Pinball League. Craig Pullen was the winner of the South West A-division region, pictured below. There were also awards for the best machines at the show to close the awards ceremony and the show.